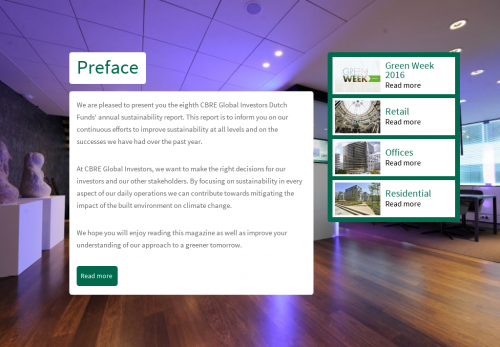 We are pleased to present you the eighth CBRE Global Investors Dutch Funds' annual sustainability report. This report is to inform you on our continuous efforts to improve sustainability at all levels and on the successes we have had over the past year. At CBRE Global Investors, we want to make the right decisions for our investors and our other stakeholders. By focusing on sustainability in every aspect of our daily operations we can contribute towards mitigating the impact of the built environment on climate change. We hope you will enjoy reading this magazine as well as improve your understanding of our approach to a greener tomorrow.